, a simple, low-cost, fast-response storage service with quick data backup, retrieval and access. Many of you operate a tiered data storage and archival process, in which data moves from expensive online storage to offline cold storage. We know the value of having access to all of your data on demand, so Nearline enables you to easily backup and store limitless amounts of data at a very low cost and access it at any time in a matter of seconds. Veritas/Symantec: NetBackup is the market leader in enterprise backup software and will support Google Cloud Storage Nearline in version 7.7. NetBackup integration with Google Cloud Storage Nearline will allow enterprises to increase business agility and information availability. Customers can seamlessly manage the lifecycle of their backups and keep a central catalog and recovery point for all their protected information, regardless of where it's stored. NetApp: SteelStore is an on-premises appliance that de-duplicates, encrypts, and compresses data before rapidly streaming it to Google Cloud Storage Nearline. SteelStore reduces data volumes by up to 30x and speeds data transport times by 400%—making onramp of your data to the cloud fast and easy. SteelStore currently supports Google Cloud Storage and will support Nearline in the second half of 2015. Iron Mountain: We’re working with Iron Mountain to design an on-ramp to the cloud via an offline ingestion service that builds on Iron Mountain's security, logistics and data management capabilities. If you have massive amounts of data and limited network connectivity, you’ll be able to simply package up and send your disks to Iron Mountain, where they’ll be uploaded directly into Google Cloud Storage Nearline. Geminare: Get Disaster Recovery as a Service (DRaaS) solutions running on Google Compute Engine and Google Cloud Storage Nearline. Geminare lets you use the cloud as your secondary data center location, enabling both DR modernization and, for the first time, cost-effective replication of your current data centers. 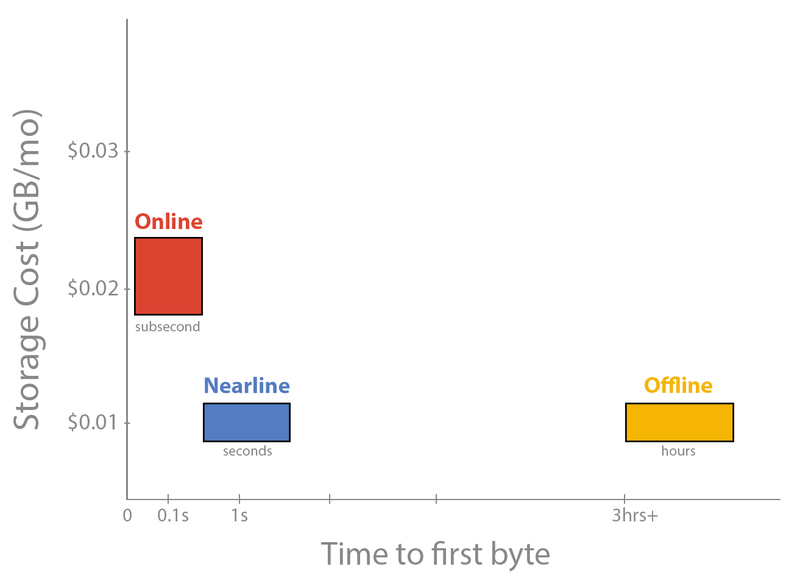 With Google Cloud Storage Nearline, you can now benefit from a very low-cost, highly-durable storage that can be used to store limitless amounts of data and have access to that data at any time. Our primary focus is to help you bring new use cases to life, and this is why we’ve worked with some of the leading backup and storage providers and are focused on growing this ecosystem. We look forward to seeing the great, innovative ways you’ll use this distinctive new storage option. To learn more about how your organization can benefit from Google Cloud Storage Nearline, sign up for our webinar on April 8 2015. To get started, visit the Nearline site and documentation! The amount of data being produced around the world is staggering and continues to grow at an exponential rate. Given this growing volume of data, it's critical that you store it in the right way – keeping frequently accessed data easily accessible, keeping cold data available when needed, and being able to move easily between the two. Organizations can no longer afford to throw data away, as it’s critical to conducting analysis and gaining market intelligence. But they also can’t afford to overpay for growing volumes of storage.